A solid close in the US session helped Asia open on a firm footing, but were reluctant ahead of the Brexit trigger to take the markets too far in either direction. So, given most were expecting Europe to set the trend and theme, let’s just jump ahead, especially given Asia closed small mixed. The morning opened with GBP again under pressure, briefly trading into the 1.23’s, but spent the majority of the day playing around the 1.24 handle. The Euro suffered a little more (currently down -0.5%) trading mid 1.07’s for the most part of the day. The fixed-income market remained well bid with strong buying interest in both core and peripheral markets. It really should not be a surprise to anyone that the UK did exactly what the vote directed it to do nine months ago and leave the EU. Markets felt nervous all day with most questioning the next move. The negotiations will start and although optimistic is a very good chance, not much is sorted within the next two year period. Finally, love it or hate it, it is what it is and now it is time to make the best of the decision made – there is no going back. At the close most core markets were positive registering gains of around +0.4%. US stocks played in a narrow range but took confidence from the strong energy prices after the inventory headlines. The Healthcare led the market closely followed by Industrials and Miners. 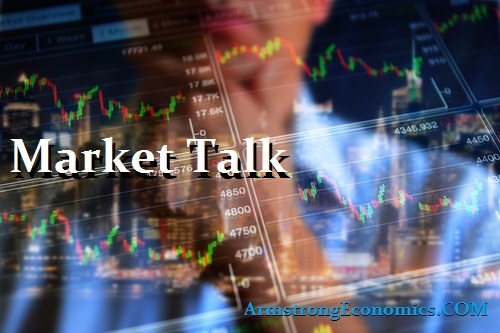 One FED Vice Chairman Stanley Fischer expects another two rate increases this year and it certainly feels like the market is starting to accept the idea that rate increases are a sign of confidence and therefore equity market positive. February pending Home Sales index rose the most since 2010. US 2’s closed 1.27% (-3bp), 10’s 2.38% (-4bp), Bunds 0.34% (-4bp) closes the spread at +204bp. France 0.92% (-3bp), Italy 2.11% (-3bp), Greece 6.80% (-14bp), Turkey 10.76% (+13bp), Portugal 3.95% (-6bp) and UK Gilts 1.15% (-4bp).